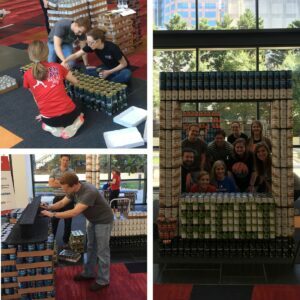 NOVA had a blast teaming up with LS3P Associated, Ltd. and J. E. Dunn Construction Group to build our “CANstagram” structure for AIA Charlotte’s CANstruction competition. Make sure you stop by the Charlotte Convention Center this week to view all of the structures! CANstruction combines the competitive spirit of a design/build competition with a unique way to help feed hungry people. Competing teams, led by architects, showcase their talents by designing sculptures made entirely out of canned foods. At the close of the exhibitions all of the food used in the structures is donated to Second Harvest Food Bank. 2014 CANstruction donated 7,988 lbs of food at a total cost of $4,331. There was also donations of $1,094. Each dollar buys 7 lbs of food so the extra money brought the total to 15,647 lbs. This amount of food provided 10,000 meals. 2013 CANstruction donated 9,800 lbs of food, providing 6,000 meals.